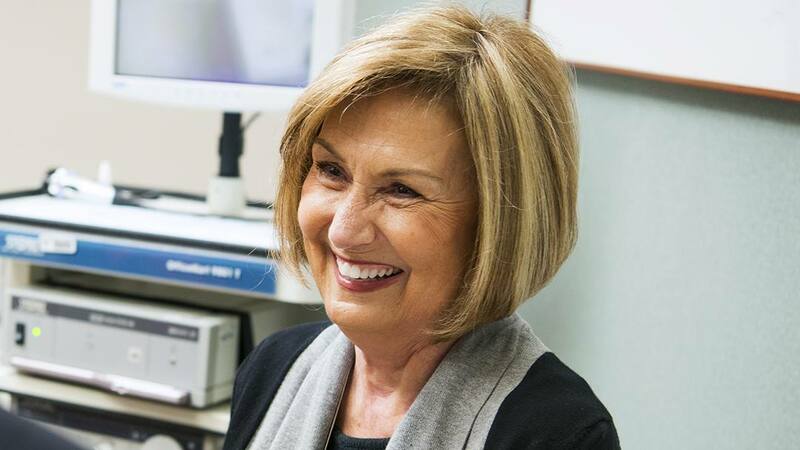 When faced with an alarming diagnosis of tongue cancer that threatened not only her health but also her livelihood, Paulette Walz looked to Mayo Clinic and found the expert care she needed. For Paulette Walz, talking is more than chatting with friends or conversing with colleagues, it's a crucial part of her job as a public speaker. Paulette travels around the country giving presentations to financial advisors and their clients on how to maximize their social security benefits when they retire. Given the important role talking holds in her work, Paulette was particularly concerned when she started noticing pain in her mouth. At first, health care providers told her not to worry. But her discomfort continued to grow, and she eventually was diagnosed with tongue cancer. 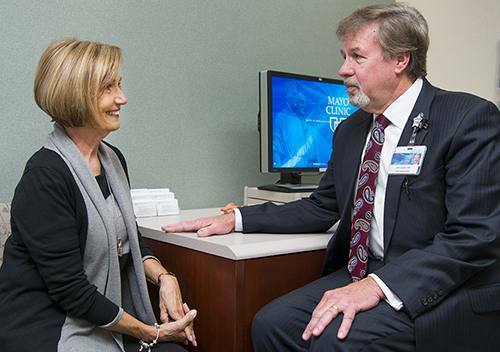 For treatment, Paulette turned to John Casler, M.D., a Mayo Clinic otolaryngologist. Although getting rid of the cancer took more than two years, her follow-up scans are now clear. Today Paulette is back to work, and she's looking forward to spending time with her husband and enjoying their years ahead together. "I cannot praise Dr. Casler enough. He saved my life," Paulette says. "You hear all your life how great Mayo is, but you don't fully know that until you are a patient there. I've never been anywhere so precise and organized. I feel the people who work there really care about you." Paulette Walz and John Casler, M.D. Paulette's symptoms began when she felt something on her tongue and had a local doctor in Leesburg, Florida, do a biopsy. The results showed no cancer. But then Paulette began having pain on her tongue. She talked to her dentist about it every six months during her cleanings. The dentist assured her everything looked fine. Paulette lived with the discomfort for three-and-a-half years. By 2015, the pain was so severe she would cry when she brushed her teeth. Her dentist referred her to a local oral surgeon who did another biopsy of her tongue. This time, the results were not good. Paulette had oral cancer. She was shocked. "I always took such good care of my mouth, so this was the furthest from my mind," Paulette says. Familiar with Mayo Clinic, Paulette decided to call Mayo Clinic's Florida campus to make an appointment. She had her first consult with Dr. Casler on Dec. 31, 2015. "The minute he walked in my exam room, I felt a sigh of relief," Paulette says. "He smiled and greeted me and was just so positive and comforting. I knew I was in the best hands." After doing another biopsy of her tongue, Dr. Casler diagnosed squamous cell carcinoma. He removed the tumor via laser surgery in mid-January. "Because the tongue is a muscle, it's easier for the tumor to spread, so these cancers can be quite aggressive." — John Casler, M.D. "Head and neck cancers are the fifth most common cancer in the United States. Tongue cancer represents 5 percent of those cancers," Dr. Casler says. "Because the tongue is a muscle, it's easier for the tumor to spread, so these cancers can be quite aggressive." Most people, however, don't require chemotherapy unless they have advanced stage disease. "Treatment for early tongue cancer is typically surgery and potentially radiation therapy," Dr. Casler says. Causes of this type of cancer can include tobacco and alcohol use, as well as chronic irritation from ill-fitting dentures, decaying dental filling and the tongue being repeatedly bitten by a tooth. "In Mrs. Walz's case, she did have a pointy tooth that was pricking her tongue, which may have been the cause of her cancer," Dr. Casler says. Unfortunately, the laser surgery wasn't the end of treatment for Paulette. Less than six months after her first tumor was removed, she developed another one. She underwent a second laser surgery to remove it. Six months after that, the cancer spread to two lymph nodes in her neck. Paulette had additional surgery to remove lymph nodes on both sides of her neck. Following that procedure, Dr. Casler recommended Paulette have radiation therapy and chemotherapy for six weeks. Paulette began treatment in December 2016 and completed it on Jan. 26, 2017. "My biggest support was Dr. Casler and my husband. I couldn't have made it without him," Paulette says of her spouse of 32 years. Since finishing her treatment in 2017, Paulette hasn't required additional cancer care. A PET scan in January showed no sign of cancer. And fortunately, given her job as a public speaker, the removal of parts of her tongue did not greatly disrupt her speech, and she didn't need speech therapy. To keep an eye on her condition, Paulette will need follow-up appointments every three months for the next two years. Now Paulette is eager to move past her cancer diagnosis. She is looking forward to doing some traveling outside of work and getting back to gardening. "Just being with my husband and living our golden years, that's what I'm most excited about," she says. "I'm grateful to be alive." Learn more about tongue cancer.